Gathering site data is a critical phase of a ‘Technical and Economic Feasibility Assessment’ for a CHP plant. This allows for accurate assessment of savings potential without going through all the rigorous design steps; thus reducing up front costs and still providing the site with an accurate estimate of project costs and potential energy (and energy cost) savings. Collection of the most recent and accurate data available plays a key role in the overall feasibility assessment process. 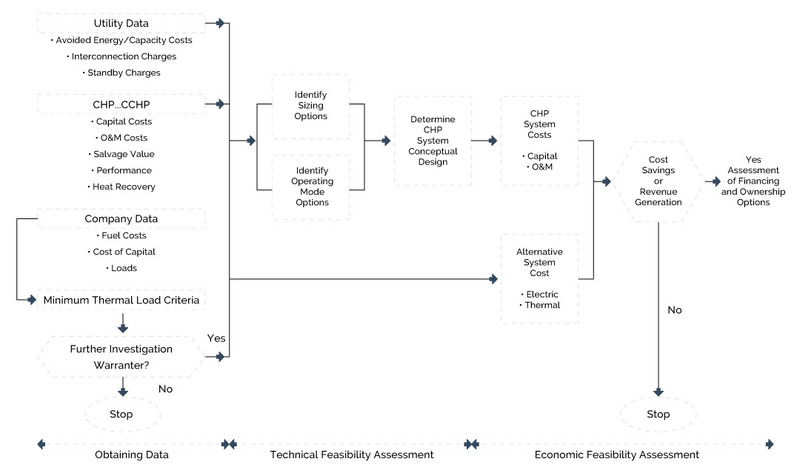 The typical assessment process is illustrated in Figure 6-1. Once this data is compiled the typical site assessment process described in this section can be completed. Obtain copies of utility bills for past two years (both Gas and Electric). This data provides insight into total energy usage and can help build energy use screening profiles. Understand the specific rate tariffs represented on each bill, secure the tariff sheets (usually available on the internet) and verify that all charges match the rate tariff sheet. Ascertain customer specific information concerning utility interconnection. Does the customer require parallel grid or stand alone operation. What switchgear is required? Evaluate the impact of purchasing back-up power from the utility. In some cases the backup power is more expensive than adding extra (or redundant) generation capacity. This must be determined prior to developing capital cost estimates. Provide a description of the amount and quality of the thermal energy (hot and cold) being used and any daily and seasonal variations. Include information such as the size of the service drop (KVA), the type of metering, applicable rate types, and if the service is three-phase. Describe any net metering if installed. Provide a general overview of the fuel used by the facility including that used for generation and/or supplemental heating/cooling. Describe the hot water system(s) and steam system(s) in place. Describe the chiller system(s) in place. Describe the absorption cooling system(s) in place.